Southern Rockies Nature Blog: The Ultimate "Prepper" Gun? Check that store-bought hex nut. At The Firearms Blog, Nathaniel F. reviews a Mongolian snaplock carbine owned by friend-of-this-blog Steve Bodio. 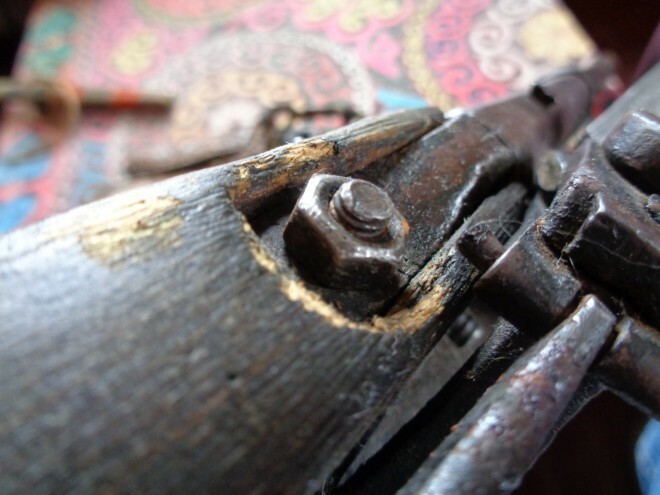 In Central Asian villages, even blacksmiths are uncommon, which means field-expedient repairs are common, and many percussion weapons get converted to the easier-to-maintain flintlock ignition. Purpose-built guns like these would be purchased by shops on rare trips to larger towns. The quality of the weapons would typically be fairly uneven, so patrons would not be allowed to fire the guns before buying, lest the shop be left with a bunch of undesirable junk guns. As a result, interesting superstitions about how to tell the quality of a rifle came to be, including putting a steel pin in a puddle of saliva on the barrel, and slowly rotating the barrel. By watching the rotation of the pin in the saliva, supposedly they could tell which barrels were good. It is no antique: Bodio estimates that it was made in the 1950s. Simple, reliable, easy to repair.